One can observe more and more formulaic flow in the Disney movies. Even for their December Christmas animated features, one year features a male and the next a female young protagonist. This year sees a young female (as it is the lady’s turn) but she dabbles in stuff that more males would be interested in – car racing. Her character, Vanellope (voiced by Sarah Silverman, who recently got her Hollywood Walk of Fame) is however, in a video game and her best friend is WRECK-IT RALPH (John. C. Reilly), who in this film breaks the internet. Her dream is to win races. The film questions the importance of friendship against chasing ones dreams. No prizes for guessing the answer! The film begins with something quite different. While a lot of scripts begin with some dream that needs to be reached from poverty, this story begins with Ralph and Vanellope having the perfect life. They enjoy what there doing, are best friends and want nothing to change. The film questions this status quo. The setting is six years after the events of the first film (also in real time as the last RALPH movie was 2012). The steering wheel controller on the Sugar Rush arcade game console breaks, forcing Mr. Litwak (Ed O’Neill) to unplug the machine. 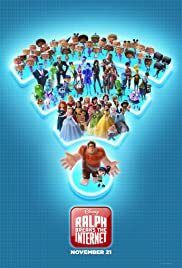 Wreck-It Ralph and Vanellope von Schweetz evacuate all of the Sugar Rush residents to other games before it is shut down, placing the racers in the care of Fix-It Felix Jr. and Sergeant Tamora Jean Calhoun. Ralph and Vanellope then use the arcade’s new connection to the Internet to go looking for a replacement steering wheel. The script uses fully all the quirks that can be found in the internet. Those who are unfamiliar (maybe none in today’s audiences) will find a few things strange but the filmmakers make the solid assumption that everyone is aware of the concept of viruses, search engines and social platforms. A few new internet characters like eBoy and Mr. Knowsmore ( the man who knows everything in charge of a search engine) sprite up the list of characters. The film also contains a few totally entertaining imaginative numbers like the tap dancing on the car hoods and the animated Busby Berkeley sequences. The film’s funniest segment is Ralph’s visit to the virus Master, Double Dan (Alfred Molina in his British accent) and told never to look at his little brother, which of course, he cannot help but do, while making comments about him all the while. John C. Reilly has an unmistakable voice and one can only expect him to do his goofy, sympathetic tones, especially in the scenes where he is pleading for Vanellope’s friendship. Two lively songs ‘Zero’ and ‘Place Called Slaughter Race’ enliven he festivities. (There are also a few songs in the other December Disney animated features).